Just added: Eventide, The Best of Friends and Never Alone. Archival gicle'es on textured heavyweight Somerset Velvet fine art paper, each individually hand made. The color life of images is more than 90 years, so your ornaments or mini frames can be handed down through the generations. These are extremely limited due to frame availability. Ellen is working to obtain more but it's unknown when we can get more. To order, you may call the gallery at (302) 539-3405 or order online below. Select Pick up in gallery to avoid shipping. 4" x 4" wood framed fine art gicle'e reproduction of Ellen Rice's oil painting of sunrise over Indian River Inlet, Delaware, The Fisherman. Printed on heavyweight, textured Somerset Velvet paper. Colors last up to 90 years. May stand on table or hang. 4" x 4" wood framed fine art gicle'e reproduction of Ellen Rice's painting, Silent Night. Printed on heavyweight, textured fine art Somerset Velvet paper. Color rendition lasts up to 90 years. Hover over picture for magnification. 4" x 4" wood framed fine art gicle'e reproduction of Ellen Rice's painting, Summer Dreams. Printed on heavyweight, textured Somerset Velvet paper. Color rendition lasts up to 90 years. May stand on table or hang. 4" x 4" wood framed fine art gicle'e reproduction of Ellen Rice's painting of an Eastern bluebird, Spring Promise. Printed on heavyweight, textured Somerset Velvet paper. Color rendition lasts up to 90 years. May stand on table or hang. 4" x 4" wood framed fine art gicle'e reproduction of Ellen Rice's painting, Watchbird, featuring a seagull atop the Bethany Beach clock, ever watchful for the next stray French fry. Printed on heavyweight, textured Somerset Velvet paper. Color rendition lasts up to 90 years. May stand on table or hang. 4" x 4" wood framed fine art gicle'e reproduction of Ellen Rice's painting of a goldfinch, "Feathered Sunshine." Printed on heavyweight, textured Somerset Velvet paper. Color rendition lasts up to 90 years. May stand on table or hang. 4" x 4" wood framed fine art gicle'e reproduction of Ellen Rice's painting of two gulls flying in harmony as the sun sets over the bay in Ellen's painting, "Eventide." Printed on heavyweight, textured Somerset Velvet paper. Color rendition lasts up to 90 years. May stand on table or hang. 4" x 4" wood framed fine art gicle'e reproduction of Ellen Rice's painting "The Best of Friends." Printed on heavyweight, textured Somerset Velvet paper. Color rendition lasts up to 90 years. May stand on table or hang. 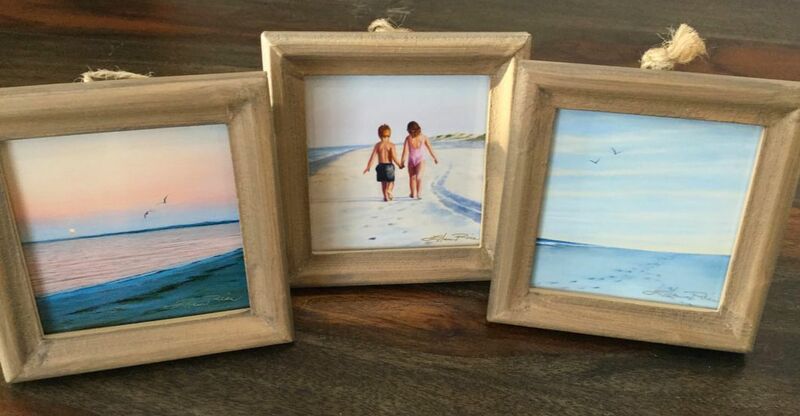 4" x 4" wood framed fine art gicle'e reproduction of Ellen Rice's painting of two sets of footprints left by a couple whose paths cross as they walk toward the light, "Never Alone." Printed on heavyweight, textured Somerset Velvet paper. Color rendition lasts up to 90 years. May stand on table or hang.